Lauren VanGelder has been chosen as one of the winners of the 2019 Edward Peck Curtis Award for Excellence in Teaching by a Graduate Student, an award given to a small number of full-time graduate students with a role in undergraduate education. Awardees are selected by the Dean of Graduate Studies and a University faculty committee, based on evidence of outstanding teaching, such as TA student and faculty evaluations, faculty letters of support and student recommendations. With this award, Lauren is recognized for her outstanding performance as a teaching assistant in a wide variety of chemistry courses, her dedication and commitment to students, and her exceptional service to the Department of Chemistry. Lauren VanGelder is a Rochester native who grew up in Brockport, NY. Lauren obtained undergraduate degrees in both chemistry (B.Sc.) and biomedical sciences (B.Sc.) at The University at Buffalo, SUNY, after which she returned to Rochester to pursue a Ph.D. in Chemistry in the Matson Group at the University of Rochester. Lauren has won several notable awards during her time at the University of Rochester. Lauren was the recipient of a prestigious NSF Graduate Fellowship Award in March 2017. In November 2018, she was selected to receive the Outstanding Chemistry Department Graduate Student award. 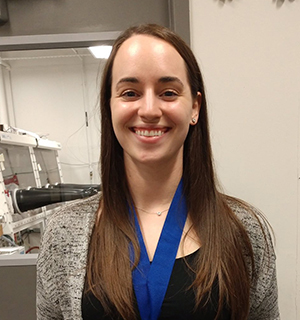 She used the funds provided by the Elliot and Laura Richman Travel Award to travel to the Gordon Inorganic Conference in Maine in Spring 2018 to present her recent work on developing energy dense electrolytes for redox-flow batteries. In October 2017, Lauren was selected as the first prize winner in a poster contest at the “New York Battery and Energy Storage Technology Consortium (NY-BEST) Energy Storage Conference” for her work on Vanadium-oxide Clusters as electrolytes for Redox Flow Batteries.